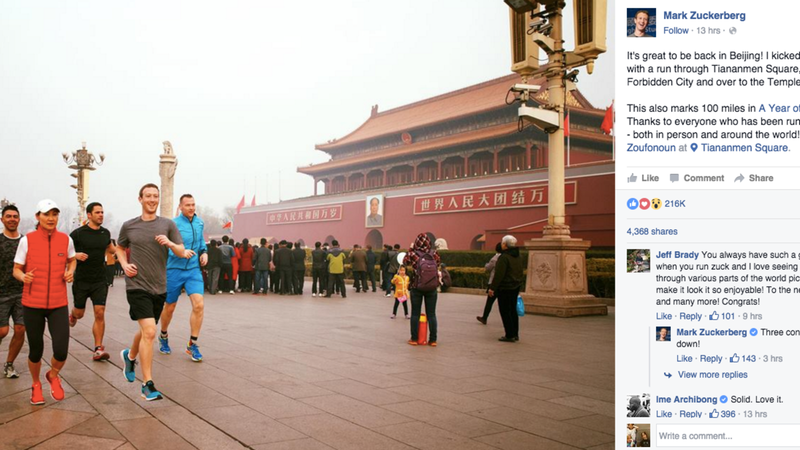 Facebook co-founder Mark Zuckerberg raised several eyebrows when he posted an image of himself apparently enjoying a morning run through Beijing, a city notorious for its dangerous smog conditions. "It's great to be back in Beijing!" Zuckerberg wrote in a post published on his Facebook page. "I kicked off my visit with a run through Tiananmen Square, past the Forbidden City and over the Temple of Heaven." He added, "This also marks 100 miles in A Year of Running. Thanks to everyone who has been running with me—both in person and around the world." A Year of Running is Zuckerberg's commitment to run 365 miles this year. At 9 a.m. an air-quality monitor at the United States Embassy in Beijing calculated the level of PM2.5, ultrafine particles that damage respiration, at 305 micrograms per cubic meter. That level is deemed “hazardous” under American air-quality standards. The color of the sky was the sort of gray hue that indicates a bad pollution day. The faint smell of something burning hung in the air. Many children on buses, or scooting to school with their parents or nannies, wore face masks. In homes and offices, air purifiers were cranked up to the highest setting. Others took issue with his running through Tiananmen Square, where hundreds of protesters were killed by the Chinese government in 1989. One commenter wrote that the site "has been covered by blood from students who fought for democracy," adding, "But, enjoy your running in China, Mark." Others wondered how he got through China's Facebook block, and others were just happy to see him in Beijing. Chinese residents wondered aloud whether Zuckerberg’s jog was a gesture aimed at pleasing the authorities who claim they are gradually winning the battle against air pollution…. “Kissing up?” commented Tom Wang, a Chinese environmentalist, who reposted Zuckerberg’s running photo and added a graphic of Beijing’s air quality readings from Friday morning. Zuckerberg has tried other tactics to convince Chinese officials to unblock Facebook in the country, like holding a Mandarin-only conversation with Chinese President Xi Jinping, and encouraging Facebook employees to read his book. So far, nothing has worked. But who knows, maybe this possibly carcinogenic run will be just the thing.